I received this funny email from my younger sister Habab aka Kabab! I found it very funny and very true as well!! It summaries some facts about driving in Dubai and UAE in general. 1. If your road map is more than a few weeks old, throw it out and get a new one. 2. Forget the traffic rules you learned elsewhere. 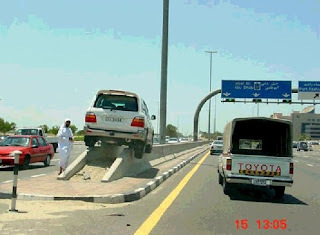 Dubai has it's own version of traffic rules, which can be summarized as "Hold on and pray!" 3. There is no such thing as a dangerous high-speed chase in Dubai Everyone drives like that. 4. When you plan to get a new car, ask first about its acceleration from 80 to 160 Km/h (recommended: 3 seconds). Very important if you frequently use the Emirates Road. 5. The morning rush hour is from 5:00 AM to 1:00 PM, The evening rush hour is from 1:00 PM to 10:00 PM. 6. Thursday's rush hour starts Wednesday morning. 7. If you are the first one at the intersection, when the light turns green ignore the car honking behind you and count to five to avoid crashing into one of the cars running the red light in cross-traffic. 8. Car horns are actually toys for big boys. 9. Anyone in a Land Cruiser, Tuned Patrol, or Mercedes with 100% tinted windows has the right of way. Period! stay on the far right lane. No comment! More snow came down last Sunday in Omaha. I drove to Barnes & Nobel book store, read a nice novel & had a (not too bad) Starbucks coffee. 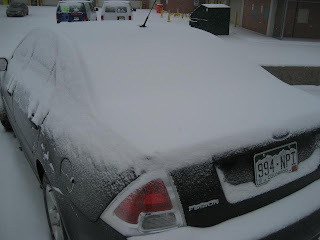 Three hours later, I found my car looking like this! Finally I saw real fresh now! 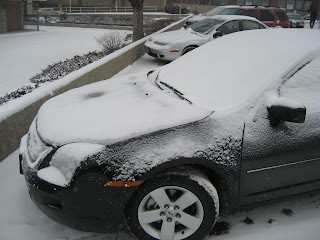 It has started to snow this morning in Omaha, and more snow is expected during the weekend. All my colleagues at work prepared me to this weekend, as they know I am coming from California and originally from the Middle East so I will have very hard time to adapt!! They keep teasing and making fun of me when they see me coming to work every morning with many layers of protections! They think I am lucky because it didn’t snow until Jan! I guess they're right.. I forgot this bottle of water in the car the night before.. I found it frozen this morning! I visited Ski Dubai for the first time last week. 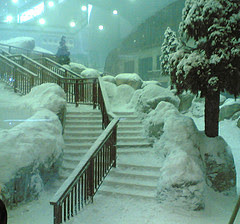 Ski Dubai is an indoor ski resort in UAE's biggest Mall (Emirates Mall). I went with my uncle's wife (Steffie) and their cute kids (Tijani and Lena) who stopped in my parents house in UAE on their way back to Manchester (UK) from Sudan. I have heard a lot about it and I got so enthusiastic to seeing ski resort inside a mall… Now, after visiting the place I have to say it is by far better than what was described to me… it is phenomenal! 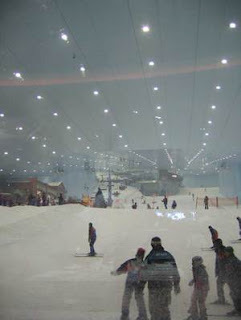 Ski Dubai has two sections: Ski area and Snow Park. We took the kids to the snow park and they loved it! Actually, I loved it too!! The snow park is like a snow playground, so it has different type of sliders, caves and hills. There is also a movie theatre! On the other hand, the ski area has 3 levels, one for beginners that is flat, and another one for intermediate skiers that has a slope and the last one for professionals that has a big slope. The prices are pretty much reasonable; access to the snow park for adults is 60 DHS ($17), and 140 DHS ($38) for skiing. Prices include all equipments.